For the past decade, Vito Drago has created work that engages with some of life’s fundamental questions. Using with a variety of media, but always with the same sensitivity to the precariousness of existence, his practice has tackled systems of expression, knowledge and control such as literature, cartography, medicine, zoology and religion. His materials have included old books and maps, genuine medical documents and, more abstractly, the raw data and information generated by particular disciplines. Meticulous research is crucial to Drago’s practice: not content with simply creating symbols for the themes he addresses, Drago is also dedicated to expressing his ideas in the most scientifically accurate language, using facts to both reinforce and question the allegories he constructs. A work from 2007 exemplifies this approach: Mors Tua Vita Mea consists of a series of matryoshka nested dolls, each of which bears an anatomically exact painting of a predator rendered in actual size, displayed to the right of a doll painted with an image of its prey. Drago’s persistent return to structures of knowledge forms a counterpoint to his interest in organic forces, and his faith – for this is where scientific belief perhaps most closely resembles religious faith – in the entropy that befalls even the most ordered of systems. Societal attempts to regulate and control seem bound to fail when confronted with the desires that motivate life itself. Natural drives, whether material or emotional, break apart carefully laid constructions and reveal the vulnerability of organising principles, a fallibility that reminds us that we are, in the words of Friedrich Nietzsche, “human, all too human”. A classically trained draughtsman, Drago has an eye for the exquisite, in both form and content. His aesthetic seduces with hints of renaissance grandeur and nostalgic subject matter, but a wholly modern critical sensibility prevents the work from ever languishing in sentimentality. For at the heart of Drago’s work lies a sharp analytical wit, which combines with his skill and craftsmanship to create an intoxicating cocktail of beauty and violence. Drago’s most recent project consists of a trilogy that addresses the foibles of human nature, the conceits of science and the frailties of existence. The exhibition at the castle of Marineo comprises three inter-related series, each of which deals with a particular ontological struggle linked to knowledge, interpretation and acceptance. The first work one encounters in the show consists of light boxes displaying x-rays, which Drago has painstakingly punctured hundreds of times along the outlines of his ‘n hers outfits. The artist refers to these works as his Vanitas, alluding to the vagaries fashion and the ultimate futility of attempts to control appearance. 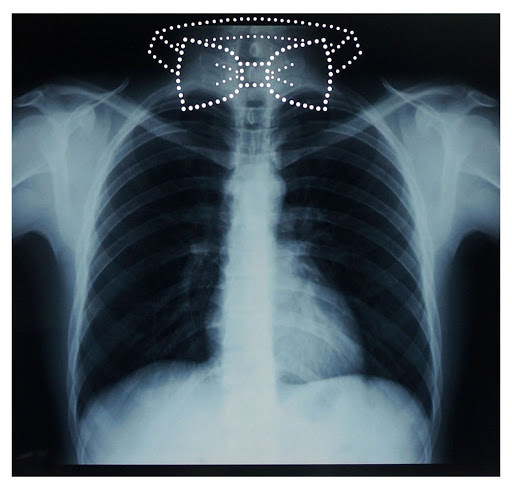 A seemingly irrefutable piece of evidence such as the x-ray could, even more so than photography in its vérité era, claim to be scientifically incontrovertible. However, by contrasting it with the frivolity of fashion design, Drago also asks us to question the truth-value of scientific material. 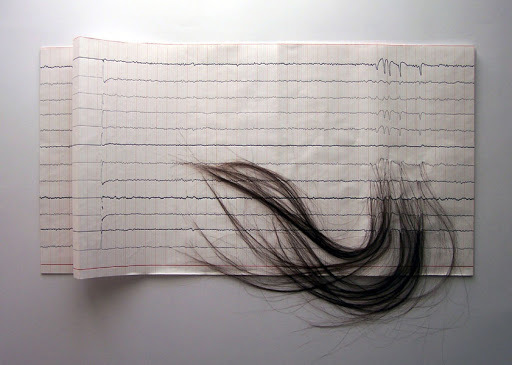 Isterica (2009) consists of an electroencephalogram onto which the artist has sewn a row of human hair. In contrast to the facticity of x-rays, the electroencephalogram requires analysis and interpretation by an expert in order to be meaningful. This hermeneutic phase of Drago’s trilogy also involves the artist’s interference. Human hair conjures up multiple associations ranging from a wild-haired ‘madwoman in the attic’ to death camps or, on a formal level, to a visual flourish that accentuates the crisis recorded by the encephalogram and expresses a striking emotionality. A series of anatomical paintings reinforces the diagnostic tone of Isterica, offering visual reminders of civilisation’s attempts to grapple with the mysteries of the human body. For the final phase of Drago’s investigation, a triptych of paintings ushers in poetry, beauty and fantasy. 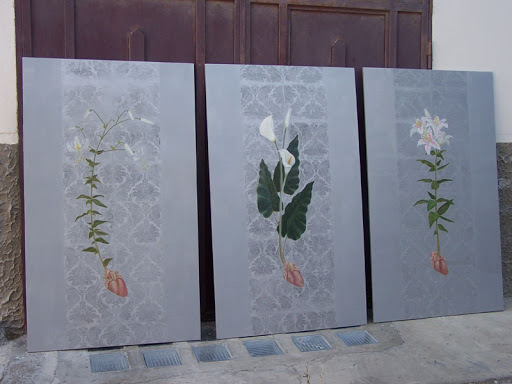 Depicting a heart out of which grows a lily – the symbol of death – these works remind us that it is frequently at the juncture of fact and fantasy that life acquires meaning. The fundamental violence of such an image, which suggests that new life can only arise out of death, also provides reassurance. We are all part of an eternal cycle; our future success depends on the demise of others. The works stand in for the unattainable dreams and fantasies that simultaneously drive and terrify us. The mechanisms of attraction and repulsion energise existence at its most basic level. Drago has spoken of this final triptych as an expedient: violence and death are essential to the genesis of new life, but, if we are honest, we will admit that this also implies something improper or even immoral in our everlasting desire for the new. And it is this honesty that lends Drago’s works their power. Seductive – yes; disquieting – sometimes; but ultimately and unabashedly honest. This entry was posted on September 29, 2009 by ellendw.